The best part is, you don't actually have to be Irish to be part of the celebrations. Color all the traditional symbols of St Patricks Day. 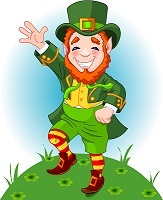 Have fun with shamrocks, rainbows, a pot of gold, lucky coins, the Irish flag and more. This happy shamrock is all ready for St Patrick's Day. 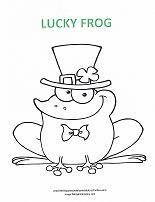 He's wearing an Irish Top Hat that holds a four-leaf clover for extra luck! 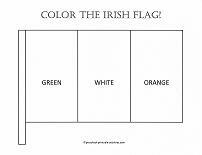 Let the kids know that the holiday originates in Ireland by coloring the Irish flag. 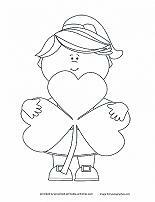 A simple coloring page with only two colors needed. Add to the lesson by showing the children a map of the world. Point out Ireland and your area. How far from Ireland are you? Frogs may not usually be considered lucky, but this fellow is making sure he is. Wear a Top Hat with a lucky clover and you may just be incredibly lucky. 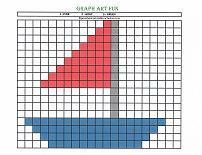 A fun coloring page and counting sheet in one. 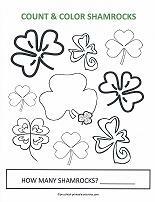 Use a green crayon to color the shamrocks. 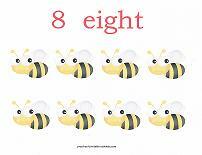 Then count the shamrocks and place the correct number in the box at the bottom of the page. What's really in the pot of gold at the end of the rainbow? Perhaps coins with shamrocks on them! 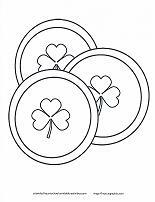 Let kids color their own lucky coins. A St. Patrick's Day color-by-number. Each of the shamrocks is numbered for the color key. 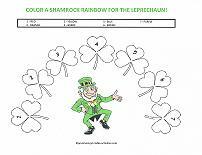 Color them red, orange, yellow, green, blue, indigo and violet to form a shamrock rainbow. Everyone knows what you find at the end of the rainbow.The colors of the rainbow lead to the treasure. 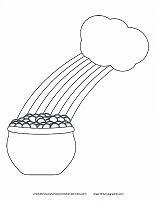 Fill in all the colors of the rainbow (red, orange, yellow, green, blue, indigo and violet) and color your own pot of gold! Color a small girl holding a shamrock. The shamrock is rather large net to the girl... perhaps she will be extra lucky! 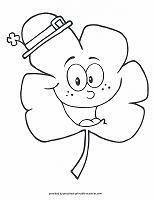 A shamrock is easily the most recognized symbol of St Patrick's Day. 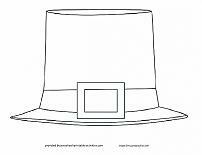 Get out the green crayons and color an Irish Top Hat.